Remember when Marlon Wayans was going to be in Batman Returns? The promise of a black Robin has finally been fulfilled! As a child, he teams up with Bruce Wayne to defeat the Riddler and later becomes the leader of We Are Robin. What a succinct and accurate bio! Duke Thomas first appeared during the "Zero Year" storyline, helping a newly returned Bruce Wayne survive the impact of a hurricane on Gotham City. Despite being a kid, he was determined to find a riddle Edward Nigma couldn't answer - the condition Riddler set for the city's safety. 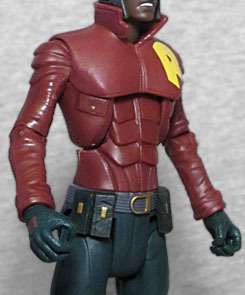 Duke next appeared in "Endgame," when the Joker kidnapped Mr. and Mrs. Thomas and planned to kill them to re-create the deaths of Thomas and Martha Wayne; they weren't killed, but they were lost to Duke, so he started acting out violently, getting into fights, and eventually joining becoming one of the untrained wannabe Robins. More has happened to him after that, but since that's what this figure represents, that's where our recap ends for now. All the "We Are Robin" Robins pretty much just wore whatever they had at home, as long as it fit the established colorscheme, but Duke's togs are slightly fancier than that - he was given a motorcycle and a leather jacket by a mysterious benefactor, and instead of using those things to get girls, he used them to fight crime. Anyway, while Duke is the same approximate size as Mattel's DCU Classics teen body, every single piece of him is a new sculpt. What the what! His high-collared jacket has wrinkled sleeves and shaped padding on the shoulders and chest. He wears a nylon belt with a big brass buckle and four narrow pouches hanging off it, though presumably his pants, with their sculpted seams and built-in kneepads, would stay up even without that belt on. Instead of some kind of high-tech boot, he wears regular sneakers - slightly oversized for him, but sneakers nonetheless. To protect his identity, Duke wears pretty cool helmet, dark silver with white lines running over the top of the head from the eyes, and a yellow stripe around the back of the head connecting the circles over his ears, kind of suggesting a pair of headphones. If you don't like that look, there's also an alternate unmasked head, allowing you to see his Greg Capullo-designed face and the lines shaved into the back of his hair. 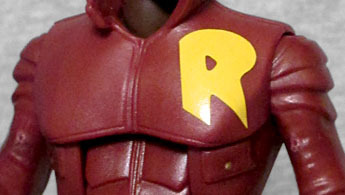 Duke gets the "red" part of Robin's costume down pat, and the big yellow R on the chest, but he lacks any green - they could have done his pants in that color, but instead, they're just a dark blue. In fact, his red is pretty dark, as well. And what's that grey helmet if not "dark white"? Say what you will, this kid already looks more prepared for a life of nighttime vigilantism than most of the "real" Robins ever have! The articulation isn't terrific, but it's not terrible, either. 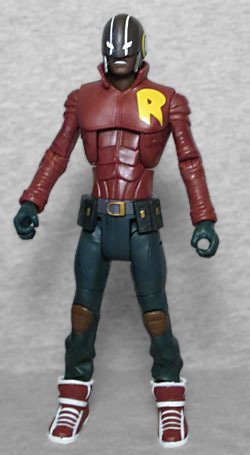 Possibly because of the swappable heads, for once a Mattel DC figure can actually look up and down a little. So that's nice. He has swivel/hinge shoulders and elbows, but the shape of the physical elbows means they won't really swivel, rending that part of the joint useless - he needed a bicep swivel. The wrists turn, of course, and the waist, and the chest is a hinge that actually works like it should. There are H-hips, swivel thighs, and really stiff hinged knees, and then ankles... of some sort? The legs just disappear down into those big shoes; there might be balljoints, or there might be swivels, or there might just be plastic glued in place and left slightly wobbly. No idea. 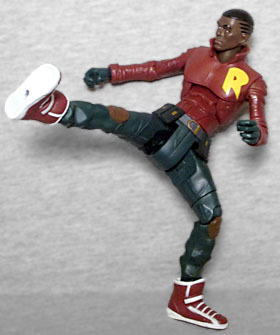 In addition to the extra head, Duke gets two accessories: a pair of nunchucks, red with a silver (molded plastic) chain, and a small red thing. It looks like a detonator, but Mattel insists its a smoke grenade, and that seems likely enough. Both the figure's hands are open to hold the pieces. Duke also includes the left leg of this series' Build-A-Figure, Jim Gordon's batbot. The leg is almost taller than Duke is! That's one big bot. I had no interest in building the Bat-bot (unlike King Shark), but I still wanted to get Duke Thomas, just because his costume is something new and he hasn't had any action figures before.